Also serving communities of Winchester, Mount Sterling. The average cost of assisted living in Richmond is $2,900 per month. This is lower than the national median of $3,346. Cheaper nearby regions include Danville with an average starting cost of $2,075. To help you with your search, browse the 19 reviews below for assisted living facilities in Richmond. On average, consumers rate assisted living in Richmond 4.6 out of 5 stars. As the county seat of Madison County, Richmond, KY is situated in the heart of bluegrass country. Richmond is home to four assisted living facilities, all of which provide elderly residents with the personal care services they need within a safe and comfortable residential environment. Personal care services include medication management and help with the activities of daily living, such as bathing, dressing and grooming. All assisted living communities in Kentucky are certified annually by the Kentucky Department of Aging and Independent Living. •The cost of living in Richmond is 11.1 percent lower than that of the country on average, making it a great choices for seniors on a budget. •The Richmond area is home to world-class medical facilities, including Baptist Health Hospital, in the event of medical emergencies or illness. •Richmond has an array of community resources for seniors, including the Bluegrass Area Agency on Aging and Independent Living, an organization that provides educational classes on health and communication as well as two senior centers. •The Richmond Area Arts Council supports arts and culture in Richmond by offering arts education for adults, seniors and children, as well as sponsoring several community choirs. Locals can enjoy concerts and Broadway musicals at the Eastern Kentucky University Center for the Arts. •The Kentucky River Foothills Transportation Department provides bus transportation for residents in Clark, Madison, Estill and Powell Counties. All transportation is funded by the U.S. Department of Transportation. •Weather in Richmond is warm and muggy during the summer, with high temperatures hovering in the high 80s and sometimes creeping into the 90s, all with high humidity. Winters are short and fairly mild, with low temperatures dipping below freezing typically in January and February. Assisted Living costs in Richmond start around $2,900 per month on average, while the nationwide average cost of assisted living is $4,000 per month, according to the latest figures from Genworth’s Cost of Care Survey. 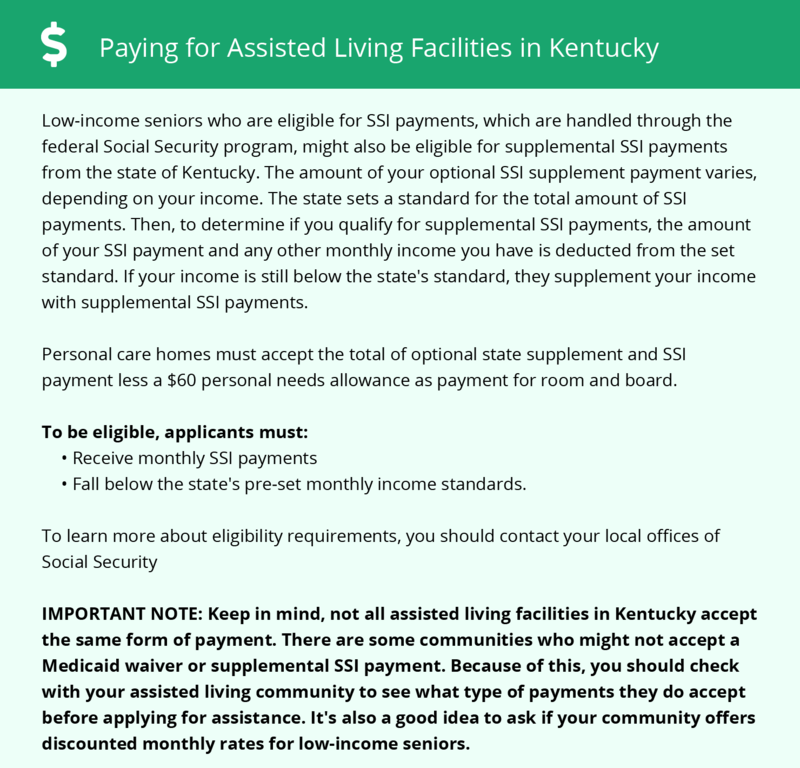 While the state of Kentucky doesn't offer any direct financial assistance to seniors in assisted living, it does offer Medicaid waivers through the Home and Community Based Services program to delay or prevent move to a nursing home. Because this program has severe enrollment caps, eligible seniors may have to spend time on a wait list. To see a list of free assisted living resources in Richmond, please visit our Assisted Living in Kentucky page. Richmond-area assisted living communities must adhere to the comprehensive set of state laws and regulations that all assisted living communities in Kentucky are required to follow. Visit our Assisted Living in Kentucky page for more information about these laws.